HESS J1731-347 - an old supernova remnant? Very high energy gamma ray image of HESS J1731-347. The image is smoothed with a Gaussian of 0.1 degr. width; the resulting "beam size" is indicated by the green circle. At the time of publication by Aharonian et al. (2008), the source was considered unidentified, without plausible counterpart. 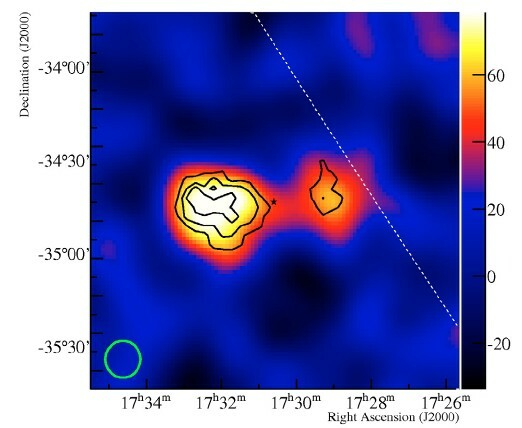 The source HESS J1713-347 was detected in the HESS Galactic Plane Survey (Aharonian et al. 2008) with a significance of about 8 standard deviations, with an intrinsic size of about 0.15 degr. rms and a significant tail extending away from the main source region, possibly even representing two independent sources. The spectrum of gamma rays from this source is relatively hard, with a spectral index of 2.3. No obvious counterpart was known at that time. This situation changed dramatically when Tian et al. 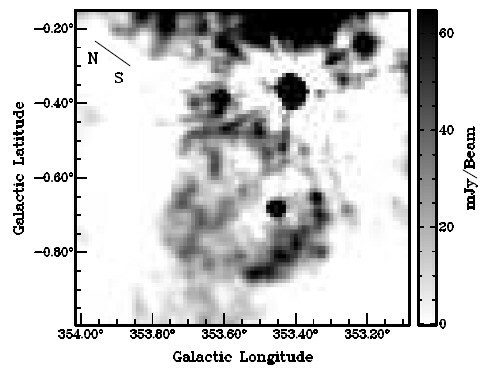 (2008) discovered in radio data clear indications for a supernova shell of about 0.4 degr. diameter, labeled G356.6-07. Fig. 1 shows continuum radio data at 1420 MHz, Fig. 2 at 843 MHz from the Molonglo Galactic Plane Survey. 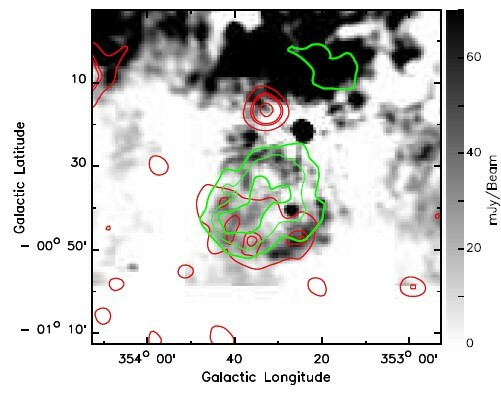 Radio data with superimposed VHE gamma-ray emission contours are shown in Fig. 3. The size of the gamma-ray source is well matched to the size of the roughly circular remnant. With the 0.1 degr. smoothing applied to the top image, and required because of the modest photon statistics in the image, a shell-like morphology is, however, not visible in the gamma-ray image. Tian et al. (2008) derive from HI emission profiles a distance of the remnant of 3.2+-0.8 kpc, implying a diameter of the object of 28 pc. 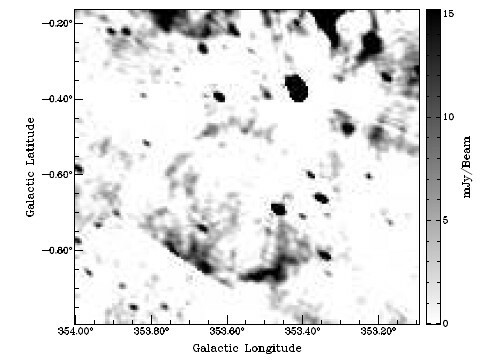 The large size and faint radio and X-ray emission point to an old remnant. Assuming nominal energetics for the supernova explosion, an ambient gas density around 5 / ccm is required to create the measured gamma ray flux by interactions of accelerated nuclei with the gas, in which case the size can be translated into an age of about 25000 - 27000 years (Tian et al. 2008). If this interpretation holds, HESS J1713-347 would demonstrate that even rather old supernova remnants can confine and accelerate particles, a subject of some controversy (e.g. Yamazaki et al. 2006). This situation motivates deeper observations in all wavelength ranges, including the attempt to better resolve the morphology of the source with higher-statistics VHE observations. Reference: "H.E.S.S. VHE gamma-ray sources without identified counterparts", H.E.S.S. collaboration, F. Aharonian et al., Astron. Astrophys. 477 (2008) 353. Fig. 1: Radio image at 1420 MHz of the region of HESS J1731-347. (Note that this and the following images are in Galactic coordinates, whereas the top image is in Ra-Dec coordinates.) From Tian et al. (2008). Fig. 2: Radio image at 843 MHz of the region of HESS J1731-347. From Tian et al. (2008). Fig. 3: The 1420 MHz radio image with VHE gamma ray source contours superimposed in green, and ROSAT X-ray image contours superimposed in red. From Tian et al. (2008).